You have spent enough money throughout the year. 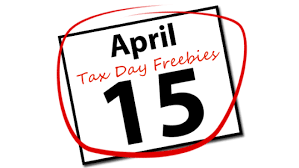 Time to snag a freebie or two and console your pain of filing taxes. Boston Market: The $10.40 Tax Day meal special includes a half chicken individual meal with two sides, cornbread and a regular fountain beverage drink, while supplies last. No coupon is needed and the offer is available from April 10-15 at restaurants and for online delivery. Bruegger’s Bagels: With the annual tax time deal, get 13 bagels and two tubs of cream cheeses, for $10.40, a $3.50-plus deduction, from April 10-15 at participating bakeries. To get this offer, be a member of the Bruegger’s Inner Circle or claim the offer at www.brueggers.com. BurgerFi: The chain is celebrating Tax Day with $4.15 BurgerFi Cheeseburgers on Monday, April 15 through the BurgerFi app only. Download the app at www.burgerfi.com/rewards. Corner Bakery Cafe: Get two entrees for $10.40 April 15-17, in-café only. 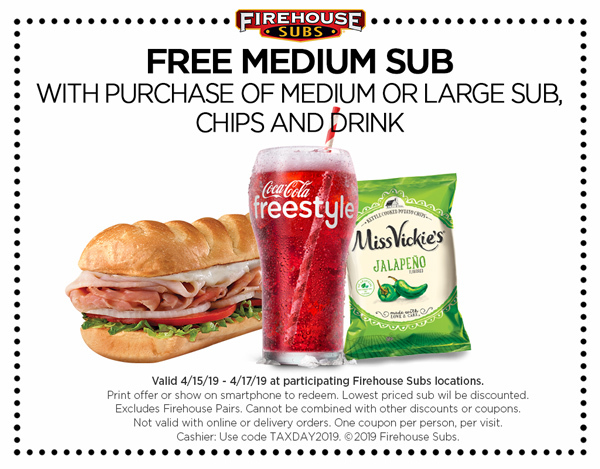 Firehouse Subs: Get a free medium sub with purchase of a full-price medium or large sub, chips and a drink April 15-17 at participating locations with a coupon that can be printed out or shown on a phone. Great American Cookies: The national gourmet cookie shop continues its annual Tax Day tradition. Get one free Original Chocolate Chip Cookies at participating locations for stopping by. Hardee’s: The fast-food chain is giving away free sausage biscuits from 7 to 10 a.m. Tax Day at participating locations. To get this freebie, you need to say, “Made from scratch.” One per customer, while supplies last. Tax not included. Hot Dog on a Stick: Get one free Turkey or Veggie Dog participating locations for Tax Day on Monday, April 15. Limit one per customer. No purchase or proof of completed taxes necessary. Kona Ice: Tax Day is Kona Ice’s National “Chill Out Day.” Stop by the company’s island-inspired trucks during select hours Monday for a free cup of tropical shaved ice. Find participating hours and locations at www.kona-ice.com/chill-out-day. Noodles & Company: Members of NoodlesREWARDS will get $4 off online and mobile orders of $10 or more for Tax Day. 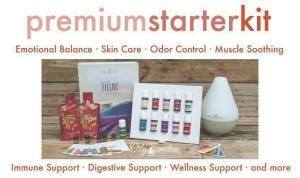 The offer is valid from April 10-15, but to get the offer you need to be signed up for the program by April 9. Sign up at www.noodles.com/rewards. Potbelly Sandwich Shop: Get a buy-one-get-one-free entrée at locations nationwide for Tax Day when you mention that it is Tax Day. Schlotzsky’s: Get a free small original sandwich with purchase of chips and a medium drink Tax Day. This deal is available at all locations and no coupon is needed. Smoothie King: Get $2 off any 20-ounce smoothie April 15-18 with Smoothie King’s Healthy Rewards app. More information will be posted soon at www.smoothieking.com/taxday. Sign up for the app at www.smoothieking.com/healthy-rewards. White Castle: For Tax Day, the fast-food chain will offer 15 percent off any order in-Castle with a coupon that will be posted on social media pages and sent to email subscribers. Thank you USAToday for compiling part of this list.